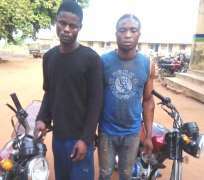 Two motorcycle snatchers, Omotayo Adenuga and Oguntuga Saheed have been arrested by men of Ogun state Police Command for snatching two Bajaj motorcycle at Abeokuta road, Ijebu-Ode, Ogun State. The suspects were arrested following an information received by policemen at Obalende Divisional Police Headquarters in Ijebu-Ode that the motorcycles were about to be sold at a give away price along Okunowa/Odogbolu road which raised the suspicion of the people in the area. The Divisional Police Officer, CSP Hakeem Fijabi led detectives to the scene where the two suspects were promptly arrested with the two motorcycles with registration number JBD 150 WZ and SPA 272 WG. The Police Public Relations Officer for Ogun State Police Command, Mr Abimbola Oyeyemi said the suspects confessed that they snatched the two motorcycles from the owners with offensive weapon. The PPRO said "During interrogation the suspects confessed further to be responsible for series of motorcycle theft in the area." The Commissioner of Police in the state, CP Ahmed Iliyasu ordered the immediate transfer of the suspects to Federal Special Anti Robbery Squad for discreet investigation. The Police Chief commended the people of the area for giving timely information that assisted the police in arresting the suspects. The CP sought more corporation from the people to assist the Police to ensure better society devoid of crime and criminality.